Neurofeedback is a proven method of optimizing brain function to impact many of the issues people struggle with. Neurofeedback is a painless, non-invasive, drug-free process that has no risk of dependency, which makes it the best option for many of our patients with migraines, insomnia, anxiety, depression, attention deficiencies, addictions, or post-traumatic struggles. We found that working with insurance companies complicated the process for both our clinic and our patients and often did not help to make neurofeedback any more affordable for those who needed it. However, we have worked to keep treatments affordable while still offering the highest quality experience possible. We’ve seen this work completely transform lives and want to make it accessible to as many people who can benefit from it as we can. 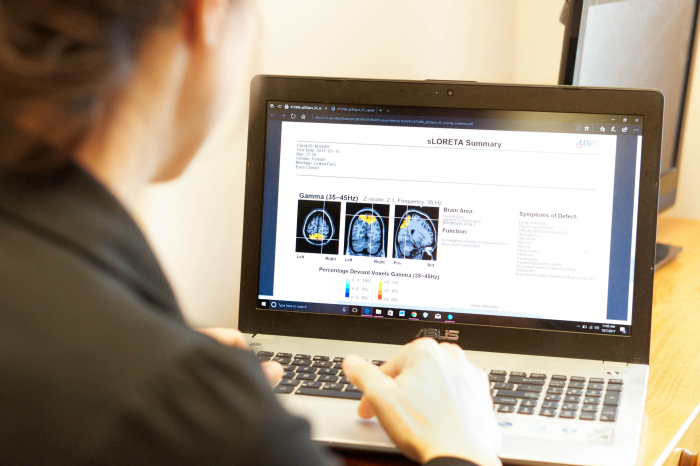 How does a brain map session differ from a neurofeedback session? A brain map is the ideal first step in understanding your unique brain and why you might be experiencing specific problems in your physical and mental function. Although we can jump right into neurofeedback treatments without a map, a map can provide us with highly beneficial information for individualizing treatment. Absolutely not. You get to sit in a comfortable armchair with painless electrodes attached to your scalp by gel, and often times just watch an episode of your favorite show while we monitor your physiological responses as measured by our clinical software at a desk a few feet away. Far less stressful than prescription drugs with harmful side effects or working by trial-and-error with internet remedies at home, neurofeedback is not only one of the most effective treatments available, but also more fun. Even if you do not see your condition on this list, please reach out to us to see if neurofeedback may be of help. How long has this science been around? Why have I never heard of it? Neurofeedback has been a recognized treatment for brain dysregulation since the 1970’s. As mentioned on our Neurofeedback page, many people do not try neurofeedback before trying other chemical or naturopathic solutions because neurofeedback sounds too good to be true. Neurofeedback works, doesn’t require pills or needles, has no risk of dependency, and can train your brain to function optimally in a reasonable amount of time.